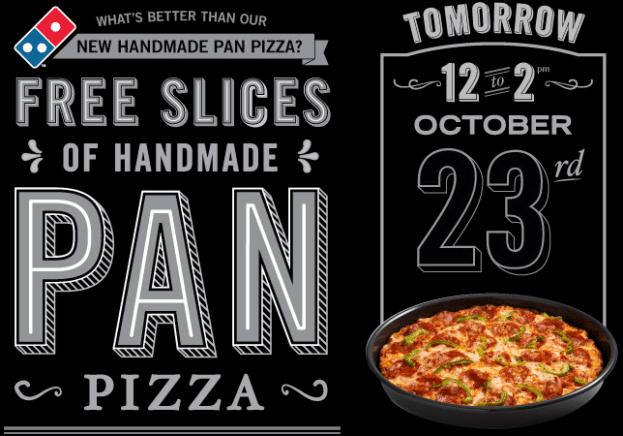 Free Pan Pizza Slice at Dominos Today starting at Noon! 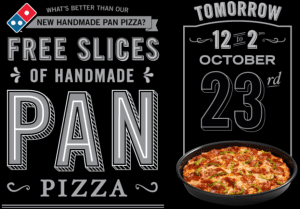 Stop into Dominos today, October 23rd, 2012 from 12-2pm to grab a FREE pizza slice of their pan pizza at participating stores. They are giving at least 100 free slices away per store, so you may want to get there at the start and call your local store to make sure their participating. To find a local store, please click here. Good luck!